Does your kids love to be outdoors? I know that mine would stay out there all day and even night if i'd let them. But with the winter we have had this year in Ohio they have not been able to be outside much. So when there is a few warm days we take full advantage of them with being outside. 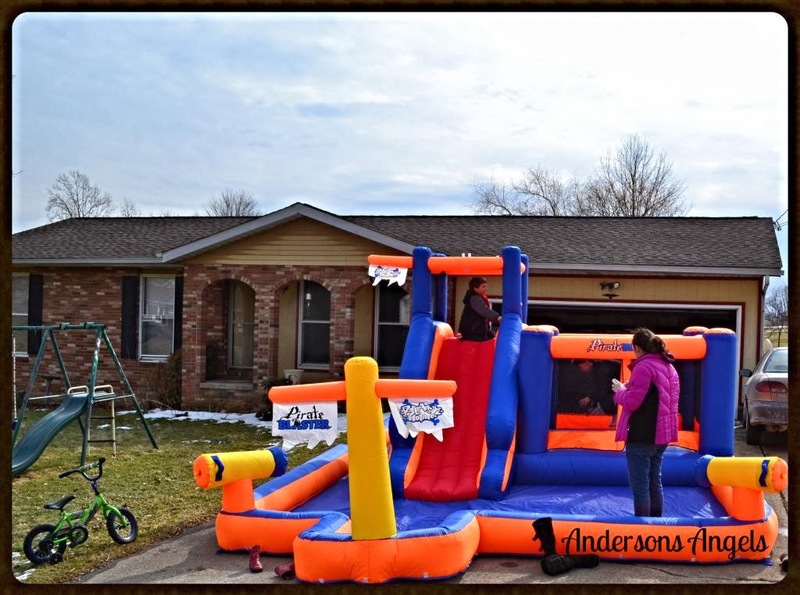 On the last warm day we decided to pull out the Pirate Blaster Inflatable Water park for the kids to play in. 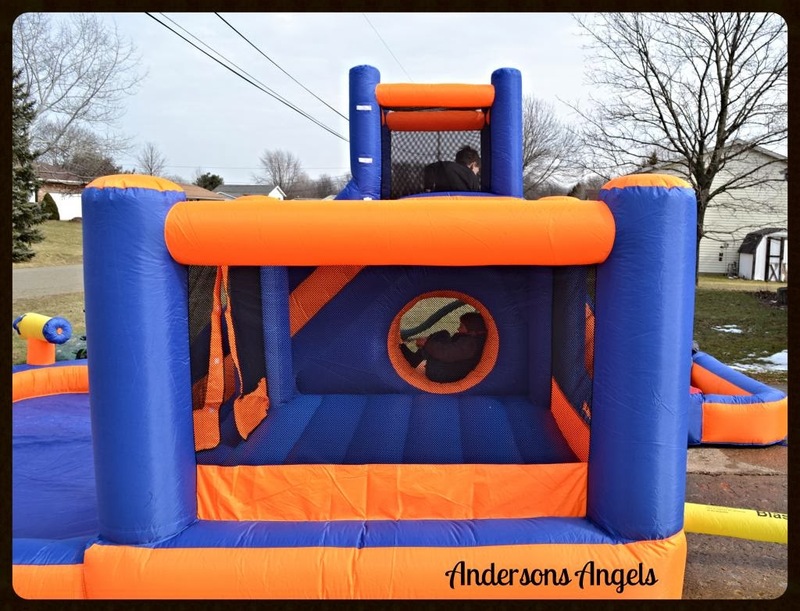 Though it was still to cold to use the water function the kids really enjoyed just playing with the slide, bounce house, climbing wall and tunnel. There are also two water cannons that the kids can use come summer and we hook up the water hoses. Setting up this water park was surprisingly simple to set up. 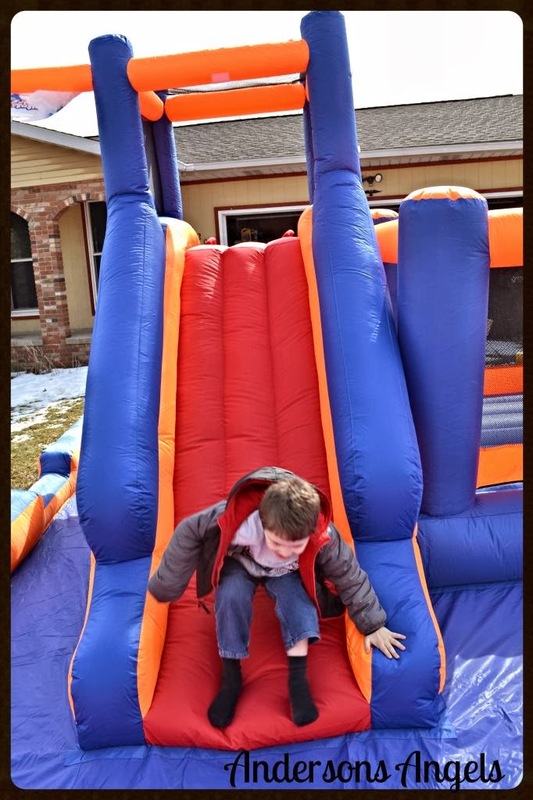 The slide and bounce house of the Pirate Blaster is manufactured using commercial grade vinyl for extra durability and light enough (approximately 90 pounds) to set up and move easily. Ninety pounds may sounds like a lot, but even I was able to set this up with ease. You simply begin by unfolding the material, attaching the inflation tube to the blower, turn on the blower and then stake everything down. Within just a few minutes we had a giant Pirate Play Land in our front yard. And giant is really and understatement - this play house measures 23.5' length, 14.25' wide and 8' high making it big enough to accommodate 6 kids up and total weight of up to 300 pounds easily. The great thing about this product is that you can use it with or without water, but I can guarantee that with water is much more fun! Once the Pirate Blaster is inflated the kids are literally entertained for hours. I love that this water park includes many features that add ease of use and safety for the kids. The climbing wall includes handles as well as foot holes which makes climbing easy for Sweet Pea. I love the extended safety netting at the top of the slide along with the higher walls on the bounce houses. The water tube has built-in flow restriction that helps minimize water use. Make sure you stop by and visit Blast Zone on facebook to keep up with all their exciting updates and news. Oh my gosh, THAT'S amazing! My boys had one and it got a hole in it. THIS would be so fun to get this year! Fred and his kids would enjoy it, too! Those water cannons would be put to use! This thing is amazing even without water involved. The kids can't wait for it to warm up outside! Wow, that is HUGE! Looks like the kids had fun with out the water. I cant wait to hear how they like it this summer! (Pirate Blaster Inflatable Water park review)These sure look like they would be a lot of fun for the kid's in the Summer months. Ummm....if we had one of those I would love it just as much as the kids. That seriously looks like a blast. We have open space behind our backyard that this would go great in. And I am sure all the neighbor kids would love it!! Now THIS looks like like a BLAST!! I just got in a Magic Castle but I would LOVE a water park - the kids would have so much fun. I'm glad to see it was easy to set up! 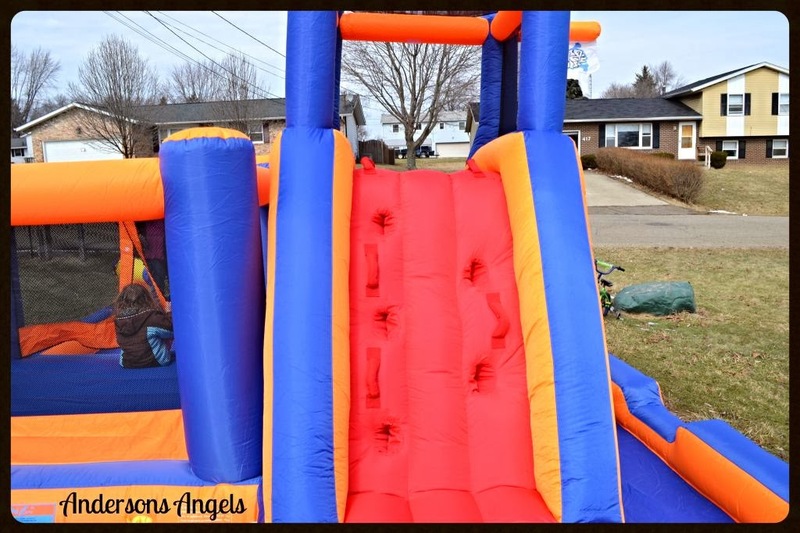 Bounce house rentals carry overflowing with entertainment and connecting with for various types of ages. Moreover its really protected so you require not to push for your youngsters.